On Thursday, Fox News host Sean Hannity wished his over three-million Twitter followers a Happy Thanksgiving. “To all my Deplorable friends, I am extremely thankful to each and every one of you for just being who you are, Great Americans! Happy Thanksgiving to all! !”, tweeted Hannity. Hours later, the ratings juggernaut tweeted a series of behind-the-scenes video clips of him cooking his Thanksgiving turkey. “After just 53 minutes, here is our 14.5 lbs Butterball turkey — Butterball turkey frier. How many of you slaved over a hot stove for hours and hours? 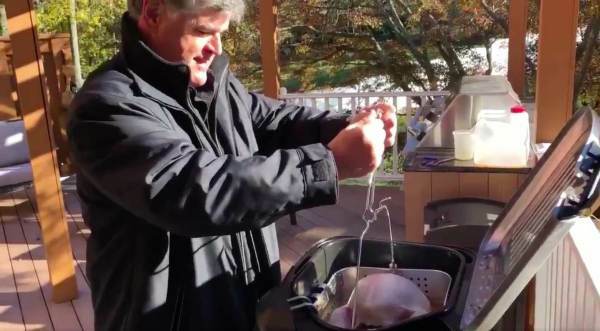 And this turkey is the juiciest turkey you’d ever have in your life!”, added Hannity. Happy Thanksgiving, Sean. Thank-you for fighting for the truth.